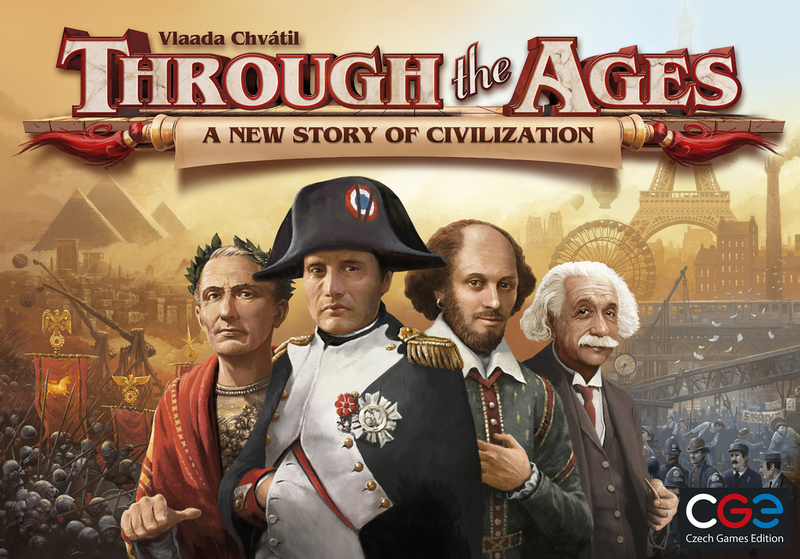 From the moment it arrived in 2006, Vlaada Chvátil’s Through the Ages: A Story of Civilization has occupied a lofty perch in BoardGameGeek’s top ten. Thus, it seems strange that the game is often characterized, even by its fans, by its flaws. The general consensus was that military was unbalanced and overpowered, several cards were either overpowered or useless, and the game was too blasted long. It seems Vlaada didn’t entirely disagree with those assessments as Czech Games Edition released Through the Ages: A New Story of Civilization in late 2015 with the goal of addressing the original game’s shortcomings. To quote Meat Loaf, two out of three ain’t bad. The changes between the new version and the old one are immediate. The artwork and other components in this new edition are vastly superior in every way. Through the Ages now doesn’t just look complicated when it’s splayed all over your table, it also looks beautiful and eye-popping enough to attract attention from passersby. Apart from the gorgeous new card art, the game has translucent cubes, stickers for each player’s wooden components which are now placed on five separate boards (as opposed to the original game, which packed everything into one massive central board). The player boards are also in a glossy, thin cardstock now instead of thick cardboard which might seem like a step down, but makes building your civilization easier when cards aren’t falling off the upper lip of your player mat and can lay flat on the table. From a gameplay standpoint, the biggest changes dealt with the military system. In the original game, military could be extremely overpowered and unbalanced due to the Tactics system. In TtA, military is represented by players building military units: infantry, cavalry, and artillery. Each turn players would draw military cards that might include Tactics cards which gave military strength bonuses based on different groups of military units. For example, a Medieval Army card would give a 2 strength bonus to every infantry-cavalry pair. A problem arose when one player would draw Tactics cards while the others would not. That player’s military would grow far beyond what the other players could achieve due to nothing but a lucky card draw. This problem has been eliminated due to shared Tactics cards. In the new game, when a player plays a Tactics card—for one military action point—it’s played to the center of the table. Each player may then, by spending two military action points, use that Tactics card. Thus, by playing a Tactics card a player only gains a military action point, and not the solitary use of that Tactic card’s ability. The second major change in the military system is the removal of unit sacrifice. In the original game, when an Aggression or War was declared, the aggressor and defender could sacrifice military units to boost their strength in the conflict. This is no longer allowed, so when a War or Aggression is declared the strength of the attacker is known when the attack commences (either immediately or a turn later for Wars). This makes defending against Aggressions much easier by keeping a steady stream of Military Bonus cards, which give a bonus to your defending military strength, in your hand. Another new rule allows all military cards to be spent as a +1 military strength bonus while defending, which mitigates unlucky draws that don’t include Military Bonus cards. Using cards for defense in this manner only works for Aggressions, however. Wars are a different beast altogether. The only way to defend against a declared War is with your own military buildup. Often, this isn’t possible in the one turn you’re given between a War’s declaration and its conclusion, so late game Wars can still be devastating. I’ve lost more than one game where Age III saw a stream of Wars of Culture played against me, siphoning culture (victory points) from me directly to my opponent. Of course, had my infrastructure been stronger and I could have reacted to his military advances, I would have gone on to beat him easily. So, the failure falls on my faulty engine and lack of food and ore generation rather than his military being overpowered. They’ve also lessened the penalty for losing a war, removing Wars over Resources and Holy Wars, which could cripple the loser’s ability to rebuild, effectively making them a punching bag for the rest of the game. Now, the only Age III wars are Wars of Culture, ensuring that even if you lose, it will not affect your civilization’s ability to build and produce. The next major change was meant to balance certain cards. In the original game there were certain Leaders and Wonders that were either nabbed every game, or never touched by anyone. For example, Genghis Khan was underpowered and hardly ever taken. His special ability gave a +1 strength bonus to cavalry units, but eliminated the strength bonus from any Tactics cards. In the new version, Genghis is remarkably strong, making infantry units double as cavalry units so they can fulfill different Tactics card requirements. Similar changes were made to all types of Leaders, and with the diminished need to push everything into military, several different play styles are now possible. Wonders were similarly tweaked, some more powerful and some less so, but the bottom line is that each Wonder and Leader deserves a look, and none of them can be dismissed as soon as you see the card’s artwork. Other rules have been added or changed as well. Now when you replace a Leader with a new Leader, you receive one Civil Action making that placement basically free. If you’re installing a Leader where there was none, it will still cost you the same one Civil Action that it always has, however. Several of the Event cards have been tweaked, making them more attractive in later Ages. For example, Rich Land in Age II originally only gave you a bonus for building a new farm or mine, which doesn’t happen too often in Age II. The new rules allow the card to either build a new farm/mine or upgrade an existing one, making it far more useful. The other changes deal with streamlining the bookkeeping portion of the game. The way corruption is calculated makes it easy to determine if you’ll have a problem with corruption at the end of your turn. Previously, turns often consisted of taking actions, realizing you screwed up and didn’t calculate your corruption correctly, and retaking those actions to fix it. This is a definitely welcome change. There’s one major issue left with the game that the new version doesn’t address, and that’s game length. Games of TtA still take upwards of three hours, and that’s with 2 or 3 players. Choose a four player game and I hope you brought a sleeping bag and a teddy bear. The game length is only a problem in that it means there are less game days with the time necessary to drag it out and play it face-to-face. I just don’t have the time for 5-6 hour game sessions, and even if we can fit in a game of TtA in 4 hours, my group would rather play 2-3 games in that same timeframe. So, as beautiful as the new version is, it will still probably only hit the table 3-4 times this year due to just how damned long it can run. Ever since I played the original Through the Ages in 2007, it’s been my favorite. I’ve played dozens, perhaps hundreds of games of it while I was busy developing the official VASSAL module which eventually crashed and burned when the brilliant online play at Boardgaming-Online went live in 2010. Since then I’ve played dozens of games there. Thus, I approached a new version of TtA with excitement and a bit of trepidation. After all, I had already purchased the original version three times (don’t ask), and wasn’t sure that I wanted or needed to get another. Also, I had fallen into a comfort zone with the original game. I knew its ins and outs and, even though I lost far more than I won (which was very, very seldom), it felt like an old, comfortable shoe. I wasn’t sure I wanted a new pair of shoes. It turns out my fears were unfounded. The new version of Through the Ages is an exceptional design, better than the original in every way. There’s nothing in the new version that makes me pine for the days of fighting over who got Napoleon or who nabbed the first Air Force card. Now, building a huge military is a bit of a gamble. If the other players stay close, but sink those few extra resources into Culture generators, you’re through. Yes, military is still important enough that you cannot let one player jump to a ridiculous lead in that category, but the results of slight differences are no longer the dagger in the throat that they used to be. The extra rules changes only serve to make the game more interesting. Sure Shakespeare was always in the game, but now I actually contemplate picking him up instead of immediately ignoring him for his science or military producing colleagues. 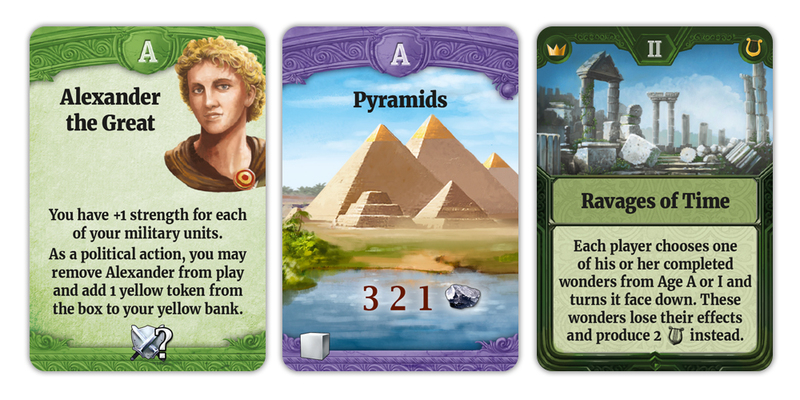 It’s like having new cards scattered throughout the game, and focusing on different aspects of your civilization are suddenly not only possible, but can lead to wins if done smartly. On top of all that, the game looks so much better that it’s nearly impossible to believe that they’re basically the same game. Whether you already own a tattered copy of the soon-to-be 10 year old Through the Ages or are just looking to nab your first copy, I cannot recommend Through the Ages: A New Story of Civilization highly enough. Michael Weston: TtA is one of my very few 10s and has been since my very first play when it first came out. I got the original first edition with the too-small-too-handle glass beads and made sure to get it on the table at least a few times year. And like so many fans I’ve put in many hours of plays at BGO and with the new version now there expect to put in many more. Dave’s review is spot-on: the new version is an improvement to near-perfection in every way, and well worth getting if you’re at all a fan of the original. If you were ho-hum on it before, give it another try unless the length really puts you off. It’s simply one of the very best heavy games to ever grace our hobby. Dale Y: When TtA first came out, I spent an entire weekend learning how to play it and then playing it over and over again. (My apologies to Christian Leonhard who got sucked into playing games with me for much of that time…) While I really liked the game, the arbitrariness of the some of the Leader/Wonder cards when combined with the longer game length somewhat tempered my love of the game. I used to love longer games, but I was never thrilled when a four hour game turned completely on when a card came up or on a single die roll, etc… Civilization and History of the World also suffered the same fate. Furthermore, the game IMHO was somewhat uni-dimensional due to perceived strength of the military aspect. While I have heard arguments against it, in my personal experience, you could not do well in the original game without doing well in military strength. The new game seems to alleviate both of these issues, and this new balanced game is much more likely to hit the table, eventhough my tolerance for longer games is much much lower. I agree with Dave that this new version would be good for both veterans and newbies to TtA – there are enough changes to feel different to an experienced gamer, and I think this provides a much better overall game that I would recommend this unilaterally over the original version to a novice to the system. This entry was posted in Reviews and tagged Czech Games Edition, Vlaada Chvatil. Bookmark the permalink. I’m in the middle of my first two BGO games since they updated. One 4P, and one 3P no war, to try some different things. Loving the changes.